An excellent way for dogs to get exercise without the stress on their joints or bones! Unique to Red Dog Pet Resort & Spa is our aquatics center. 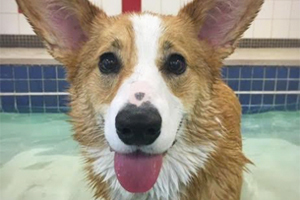 Your dog will enjoy time in one of our supervised aquatic offerings, which include Introduction to Swim, Private Fun Swim, Fitness Swim and Hydro Massage Swim. 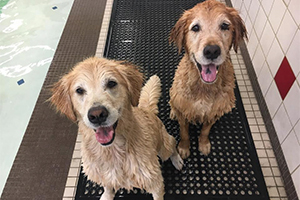 Warm water exercise has numerous benefits for pets and is ideal for arthritis, improving flexibility, increasing endurance, weight loss, relaxation, building confidence, athletic & post-surgical conditioning, and general overall wellness. We partner with your veterinarian to begin your dog’s journey to vitality. If your dog has any medical condition, injury or pre/post-operative needs, we’ll need a note from your veterinarian clearing your dog for activity. Visit the Association of Canine Water Therapy for more info. Your dog has never swam before? First time swimmers young and old can benefit from this shorter introductory swim session. We use a slow and steady approach to get your dog comfortable in the water and positive reinforcement through provided toys and treats, breaks when needed and a focus on confidence training. Introduction to Swim is an ideal option for a relaxed and safe first swim or for a dog who is nervous or expresses fear around water. Our Aquatic Specialists use their expertise to make a potentially traumatic and overstimulating experience, a fun and enjoyable one! Please note that the first time in the pool can be a hard one for your dog! Pet owners may be asked to watch from the windows outside of the pool room located in our lobby to minimize stress and allow the bond between your dog and the practitioner to develop. Fitness Swims are a great form of zero-impact exercise, focused on endurance and stamina training. The buoyancy of water relieves any weight or strain on a dog’s joint, relaxing the body and improving mobility. This is a great option for pet owner’s looking for their dog to gain muscle or a dog recovering from surgery or an accident in need of rehabilitation. 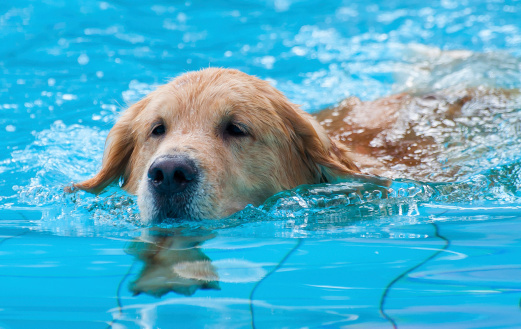 There are many reasons to consider Fitness Swims are ideal for younger dogs, dogs with excess energy, old injuries (not in a current healing state) and does who need a therapeutic swim. Our 30-minute Fitness Swim includes a one-on-one supervised swim session with our Aquatics Specialist. Multiple guests require separate appointments. 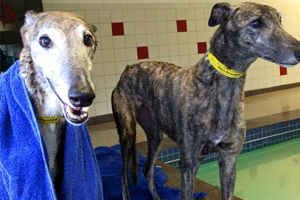 Hydro Massage sessions are specifically designed for dogs with a range of physical conditions. 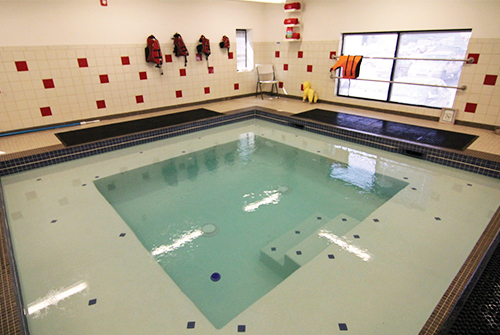 Each 30-minute session is a combination of stationary swimming and warm water massage. We will have most dogs wearing a life jacket, which we provide, to ensure controlled laps and to ease dogs into the pool if they are unable to use the stairs. Our highly trained Aquatic Specialists will customize therapeutic movements for your dog’s needs to increase range of motion and guide stretching as well as watch for any signs that your dog may need a break. Hydro Massage is ideal for dogs with arthritis, most physical conditions, ACL injuries, degenerative myelopathy, paralysis, bone/joint, muscle pain or injuries. All packages are non-refundable and expire 1 year from the date of purchase.